High dessert between Lancaster and Edwards AFB, California. I sold my BMW motorcycle last month. It was 17 years old, had 65,000 miles on it, and while is was still a bike I would take anywhere, the maintenance costs were starting to creep up. After a four week search on Craig's List and eBay, I found a 2007 Yamaha FJR that had low miles, meticulous maintenance, and most of the options that I was looking to get. 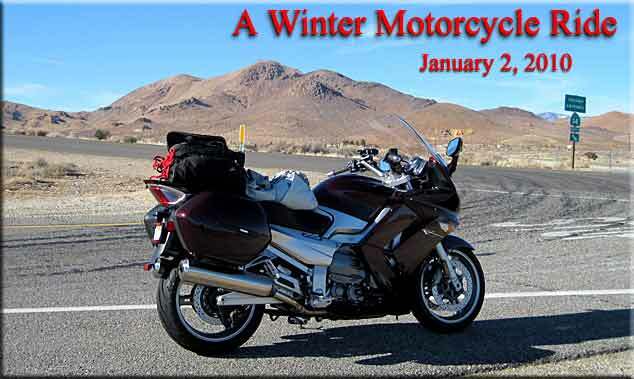 One minor problem was that it was in Lancaster, CA, and this was the end of January. The long range weather forecast indicated Pacific temperatures in the mid-40s, so I decided to get it and ride it up before something colder moved in. I flew to LAX and caught a shuttle bus to Palmdale/Lancaster. The motorcycle turned out to be every bit as good as promised, and even had a couple of accessories they had not mentioned in the add. By 3:00PM, the transaction was done, I was suited for cold weather, and headed out. There are four mountain passes of about 4,000 feet each that I needed to get over: Tehachapi Pass to get me out of the high Antelope Valley where Lancaster, Palmdale and Edwards AFB are located, the pass at Mt. 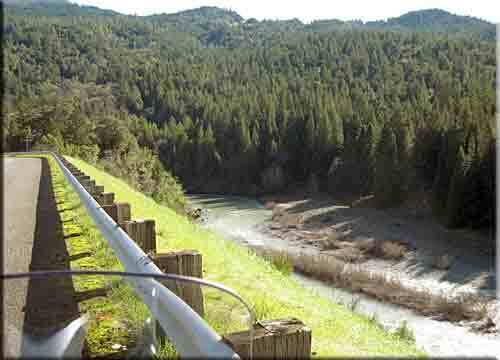 Shasta, the Siskiyou Pass which drops down into Ashland, Oregon, and the Grants Pass in Oregon. Snow or ice in any of these passes would be a deal killer, at least if I was to use Interstate 5, the fastest route. Tehachapi Pass, which was nearby to the above photograph, proved no problem. While there was snow in the surrounding mountains, the road was dry. Soon I was descending out of high dessert, leaning into moderate curves on Hwy 58, and headed for Bakersfield. My new FJR made a quiet purr, and its big 1300cc engine was unfazed by anything I asked of it. 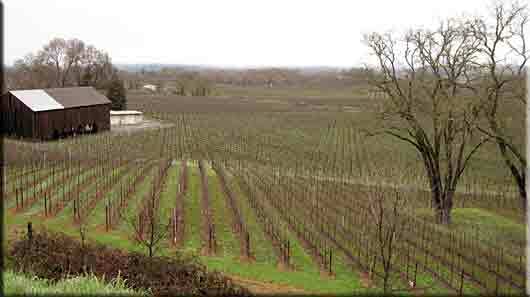 My destination was Rob and Kathy Franklin's house in Merced, so I turned up Interstate 99 and started ticking of the towns of the San Joaquin Valley: Bakersfield, Fresno, Tulare, and finally Merced. From the freeway, these towns no longer had the agricultural feel that they did in decades past. Instead, I was presented with views of identical, stucco shopping malls, each boasting the same names, Costco, Home Depot, Pet Smart etc. Tract homes spread out with a sameness across what used to be productive farmland. I'm sure that if I left the freeway, I would eventually find the unique little downtown areas, but the new construction was just that, new construction. I made it to Merced after dark, and found Rob and Kathi's attractive home located at the edge of farm country. Despite having worked at the High School all day, they could not have been more hospitable. They took me to an authentic Mexican restaurant, where we discussed a variety of things, including the effects of California's budget problems. Kathi is an administrator at the high school, and she is involved in putting into effect the staggering budget cut that has just been given to the school. It is very hard to be told that it is your job to make decisions that can't help but create pain in the lives of many people, some of whom you know quite well. Rob and Kathi made an early start in the morning while I waited until 9AM to let things warm a bit. I had two short rides ahead, firstly to Lafayette, CA to look at our old stomping grounds and have lunch with my friend, Graham Jacket, and then a jaunt south to Sunnyvale, CA, where I would spend a day with my kids. I found Contra Costa County not much changed from six years ago, and Graham Jacket was his familiar self as well; still enjoying his grandkids, still loving California, and still doing his annual camping trips to Hawaii. I should add that Graham is one of the most motivational people I know. Feeling a little unmotivated, just have lunch with Graham. The trip down to Sunnyvale was uneventful. The freeway coming out of the Silicon Valley was a parking lot, but I was going towards the Valley and moved right along. I spent a pleasant evening with my son Eric and daughter-in-law, Irene and we went to a superb Chinese dumpling house. The next day we went to San Francisco and spent the day with Carla and her dog, Kobi. 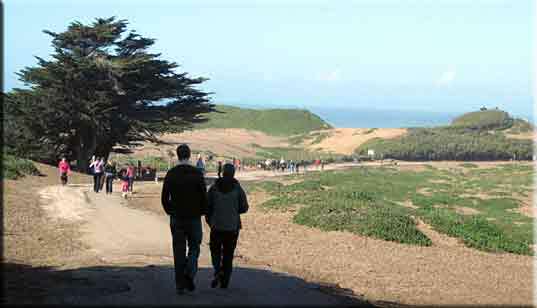 Fort Funston is a beautiful park on the ocean cliffs across the street from the Olympic Club, where the U.S. Open golf tournament is sometimes played. The park is a haven for hang gliders, which catch the ocean air shooting up the cliffs. 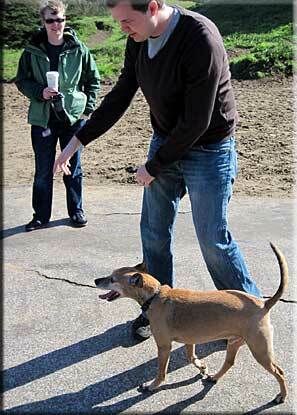 It is also a haven for dogs, a huge off leash area that attracts hundreds of animals with their owners not far away. That evening I took in a visit with long time friends, Dan and Susan Carr. I had not seen them in way too long, so it was good to catch up. Evaluating a petition for signature. It was time to head north, which meant committing to the route. The forecast called for rain showers, with the best day being the next day, Sunday. 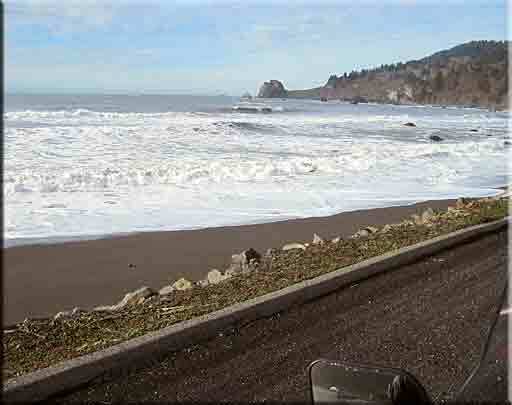 I decided to play it safe and take Highway 101 along the coast, which has no significant high elevation. I also decided to push all the way to Yachats, Oregon rather than spending a night in Eureka in order to take advantage of the better weather. I got up early and made my departure at 5:30AM. The traffic was very light, of course, and I quickly made my way to the Golden Gate Bridge. Here I hit rather heavy fog, and I did the dance of going slow enough to stay within my ability to stop, while not going so slow that someone would hit me from behind. Past Sausalito, the fog eased enough to make for comfortable visibility, although, for the next three hours it was foggy enough to be damp and the temperature stayed at 43 degrees. My riding gear kept me comfortable even in the fog, but the humidity fogged the inside of my visor, necessitating that I crack it open to clear the fog, while enjoying a cold blast of air on my chin. 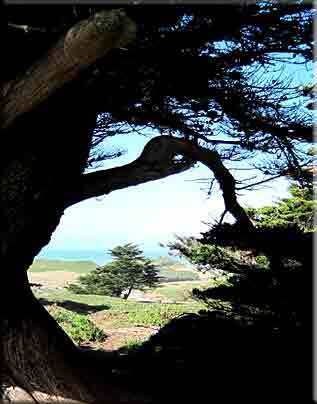 Finally, in Mendocino County, the fog lifted and I had patches of sun for the rest of the day. Highway 101 was a delightful ride. The vineyards of the wine country gradually gave way to redwood forests and I took the time to once again take in the magnificent giant redwoods on, "Avenue of the Giants," north of Garberville. 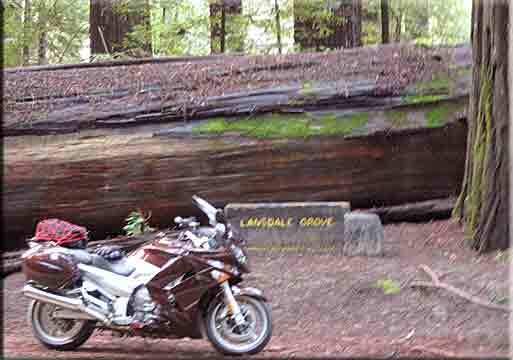 From there is was some satisfying high speed twisties on Hwy 101, and then the logging country of Eureka, California. 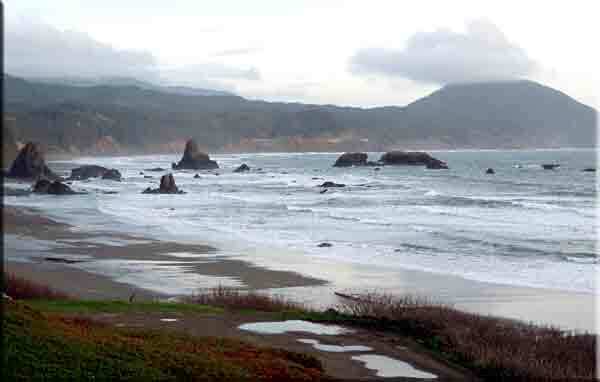 I stopped in Eureka for a salad, imagining the magnificent cannabis plantations in the surrounding hills :) Further north I reached Crescent City, CA, and from here I was largely riding within sight of the ocean. Lower Half: long underware, jeans, riding pants (rainproof and abrasion resistant. Extremities: chemical toe warmers in both boots and gloves. Wool socks. Electric vest: plugs into motorcycle. Mine is a Gerber with a heated turtleneck collar. So warm I have to cycle it off and on. Redwood forest along the Klamath River. 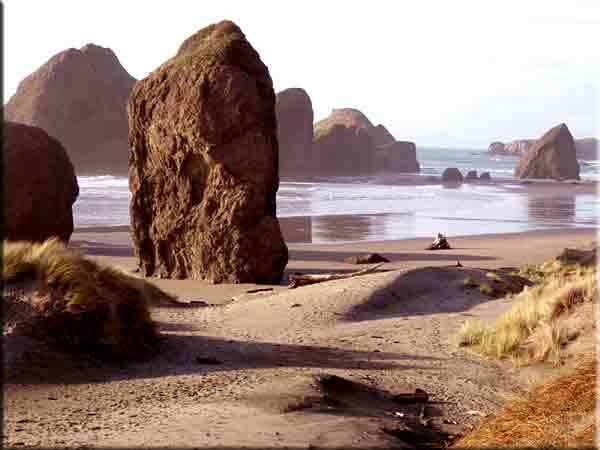 The Pacific Ocean in Southern Oregon. 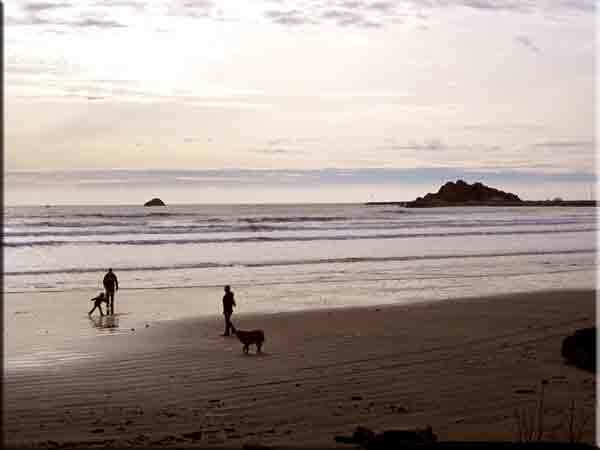 Frolicking on an Oregon beach on the last day of January. I rode the last hour in darkness on the twistiest segment of the whole day. Fortunately, the high beam on the FJR is not only bright, it is broad, illuminating my turns. 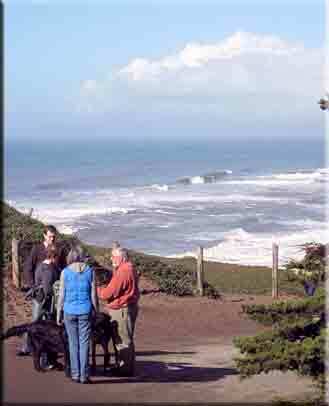 I arrived in Yachats, OR, at 6:30 PM and was greeted by Greg and Nan Scott. Nan had a hot Mexican Pizza in the oven, and I thawed as we caught up on recent events. The next day I had a short three hour ride to Vancouver, WA. 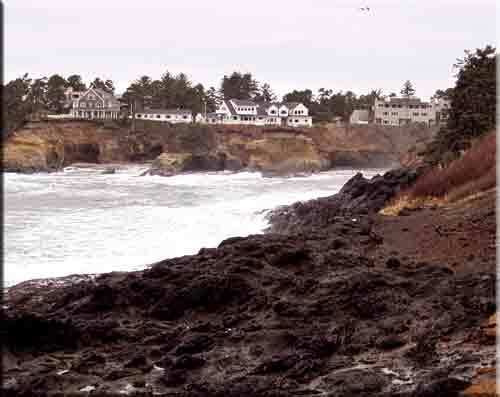 It rained steadily as I rode another 40 miles up the coast and then turned inland over the coastal hills to Salem. From there it was I-5 north to Portland, I 205 around the city, and then over the mighty Columbia River into Washington and Vancouver. I enjoyed the hospitality of Glenn and Delcine (my aunt) Schmitke for the afternoon and night. Tuesday, my last day, consisted of a 3 1/2 hour ride up I-5 to Seattle, where I stopped in China Town for the obligatory bowl of duck noodle soup. Then it was another 1 1/2 hours further north to Anacortes, WA- home. 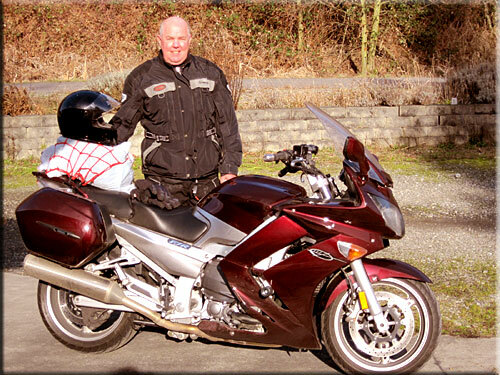 It was a great 1,400 mile familiarization ride of my motorcycle. I did not have one problem with it the entire trip. I thank my hosts along the way for their hospitality. Visits with friends and relatives are at least half the fun of traveling. My dirty Yamaha FJR 1300, almost home after a 1,400 mile winter ride. Looking like a Teddy Bear with multiple layers. Comparison of BMW K1300GT, Concours 1400, Yamaha FJR 1300, and Honda ST1300.